But Mr. 66 just fascinates me. This milky-white-skinned older gentleman is maybe in his 70s. He seems like a townie—someone who has lived in my Boston suburb for years, maybe even his whole life. But you’d think he’d say hello to someone on the street if he had. He stands silent. He wears the same outfit everyday—he looks like a man who would own a closet full of the same pants and shirt lined up neatly in a row. A perfectly pressed white dress shirt is thin; his white T-shirt peeks less than discretely from underneath. Black trousers, also pressed, are belted far above his waist, emphasizing the convex arc of his stomach. That belt, by the way, carries a cell phone holster for his flip phone. Black shoes pop out from under the cuff of his pants, reminders that he does, in fact, have legs. Sometimes he sports a tie and wears a black jacket (only if the rain is torrential). But the best parts are his large, clear acrylic-rimmed glasses and his black chapeau, which I’ve seen leave his head only one time when he was really sweaty. (I can confirm that there is very, very short-to-the-head white hair under there.) The frames of his glasses are wide enough to be windows into his gentle, gentle eyes. He is the original Boston hipster. Mr. 66 can’t be bothered to stand around for more than a minute. His home stop is the same as mine. But if the bus is late (so every day), he’ll pace up the street, place his hand horizontally on his brow, stand on the toes of his feet, and look into the distance. 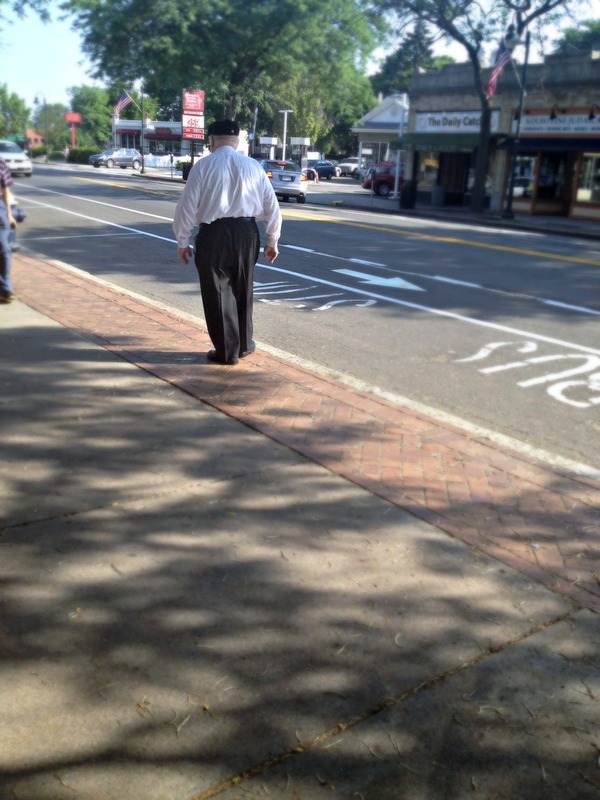 If there’s no bus in sight, he walks. He’ll walk to the next stop, wait, and watch. He’ll walk to the next, wait, and watch. He’ll walk from stop to stop until the bus catches up with his paces. And when he gets on, no matter how many seats are open, he will not sit. He stands at the head of the bus, serving as it’s keeper. Our keeper. My first day with Mr. 66, I naïvely asked if he wanted my seat, since I’m still a relatively spry thing. “No,” he uttered in a mere whisper. I don’t enjoy hearing the word “no” from a man I (secretly) love. I learned to never ask him again. Maybe it’s comforting to be around the old. Maybe his will gives me courage, comforts me in a time of need, pushes me to work harder. I’m not sure, but right now he is my favorite of the constants in my life. I’ve even daydreamed a bit about his personality. Creepy? I hope not. He looks like a man who would grab a seat at the counter of a diner and order just dessert. He looks like he’d like a slice of thick New York–style cheesecake, dripping with that fresh blood-colored cherry-pie-filling-out-of-a-can that often sits on top. He looks like he would walk to J.P. Licks and grab a kiddie cone, walking down the street and licking, working so hard not to stain his sharp white shirt. I walk home from work, unless there is lightning striking. And I bump into him at some point on my route almost everyday. He’s probably walking after a bus. And on weekends, he is out and about. Just walking the town. He makes my day. I even walked by him when I bought a bottle of amaretto for this recipe. It was fate. So this dessert’s for Mr. 66. It’s a pairing of cherries and ice cream that, if my above predictions are correct, he would be sure to love. 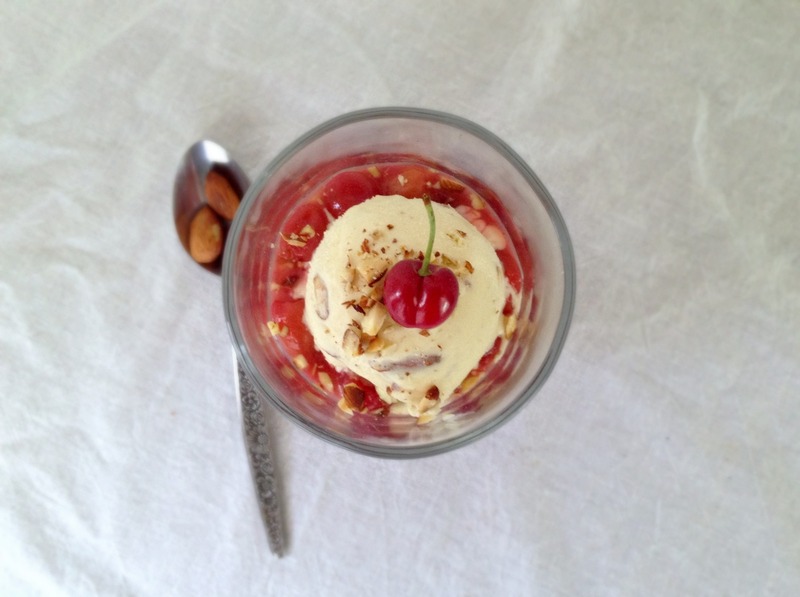 Cherry—real, fresh, in-season cherries—and almond is one of my favorite flavor combinations. 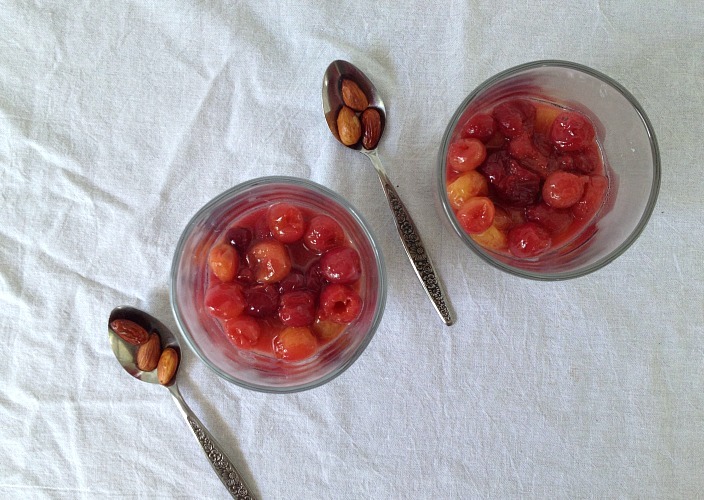 The natural almondlike flavor of the cherries’ pits makes the two obvious bedfellows, kind of like apricot and almond. The ice cream, Butter-Toasted Almond-Amaretto, has a deep almond flavor that one could never get with the typical addition of almond extract. It’s almond first, then amaretto. The milk-cream base is infused overnight with deeply toasted almonds, then mixed into the egg custard; finished with a shot of sweet, warm amaretto; and peppered with very coarsely chopped butter-toasted, salted almonds. It is served simply with sautéed cherries made with sweet cherries (I used a mix of local red cherries and rainier cherries, which I adore for their fruity, almost wine-y flavor) and little else. This isn’t a sticky dessert sauce. You know, many cherry desserts are medicinal, artificial, super-sweet, and goopy. This ain’t that. (Don’t let the pinkish color fool you; again, I used cherries with light-colored flesh.) Think of it as a not-at-all cloying, fresh cobbler à la mode without the topping but with crunch from the fallen almonds. With another smattering of finely chopped butter-toasted almonds on top, this sundae might not be something Mr. 66 ate as a kid, but I can dream that he’ll knock on my door one day for a bite of it, before he is off, walking towards another bus stop. 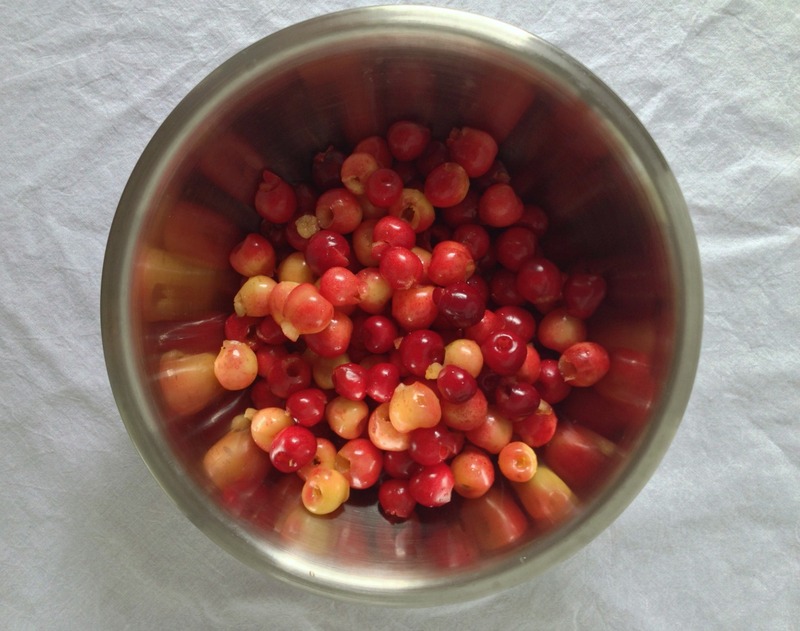 Flavor your cherries with sugar and lemon juice to taste depending on the sweetness of your cherries and your tastes. More sugar will result in a thicker, glossier sauce, but I prefer to use just what’s needed so as not to obscure the natural flavor of the cherries. 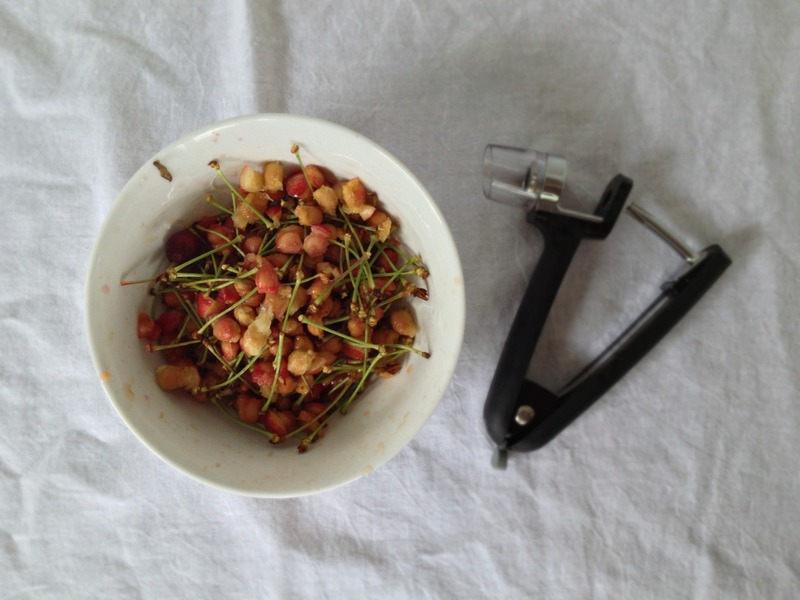 Cooking times may vary depending on the texture of your cherries. Our local cherries are juicy but smaller, firmer, and less plush than your average Bings or supermarket cherries, so you may very well find that your cherries cook faster. I prefer to use an amaretto, like Marie Brizard or Luxardo, that is not overly syrupy for this recipe to keep the sweetness at bay, but a more common brand would certainly work. 1. For the Ice Cream: Adjust oven to middle rack and heat oven to 350 degrees. Spread 1 cup almonds on rimmed baking sheet and toast deeply, 10 to 14 minutes. Let almonds cool completely. Pulse almonds and salt in food processor until finely chopped, about 15 pulses. Bring finely chopped almonds, 1 cup heavy cream, milk, and sugar to boil in small saucepan over medium heat. Cover saucepan, turn off heat, and let stand for 1 hour. Transfer almond-cream mixture of bowl, cover tightly with plastic wrap, and refrigerate for 8 hours. 2. Strain chilled almond-cream mixture through fine-mesh strainer into large saucepan, pressing firmly on almonds with stiff rubber spatula to extract as much liquid as possible (save spent almonds for another use). Whisk egg yolks together in medium bowl. Place remaining 1 cup heavy cream in medium bowl and set strainer on top. Place bowl and strainer over ice bath. Bring cream mixture to boil over medium heat, pour a small amount into egg yolks, whisking constantly, to temper, then whisk in remaining cream mixture in steady stream. Transfer cream-egg mixture to saucepan and cook, whisking constantly, over medium heat until line drawn down custard-coated spoon holds and custard registers 170-175 degrees. Pour custard through fine-mesh strainer, into heavy cream. Whisk in amaretto. Cover tightly with plastic wrap and refrigerate for 8 hours. 4. For the Cherries: Melt butter in 12-inch straight-sided sauté pan (or 12-inch skillet) over medium-high heat. 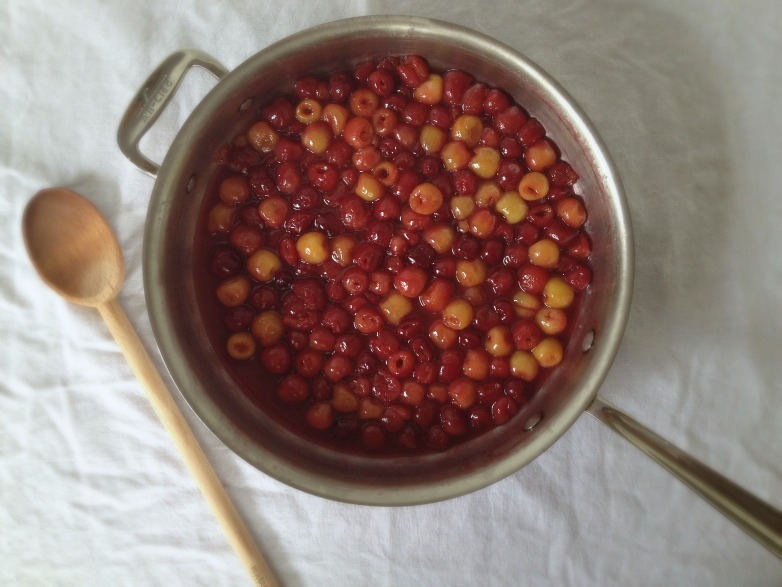 Add cherries and cook, stirring constantly, until cherries just lose their rawness and give up some juices. Add sugar, lemon juice, and salt, and cook, stirring constantly until juices thicken to your desired consistency, 6 to 8 minutes. 5. Finely chop remaining toasted almonds. 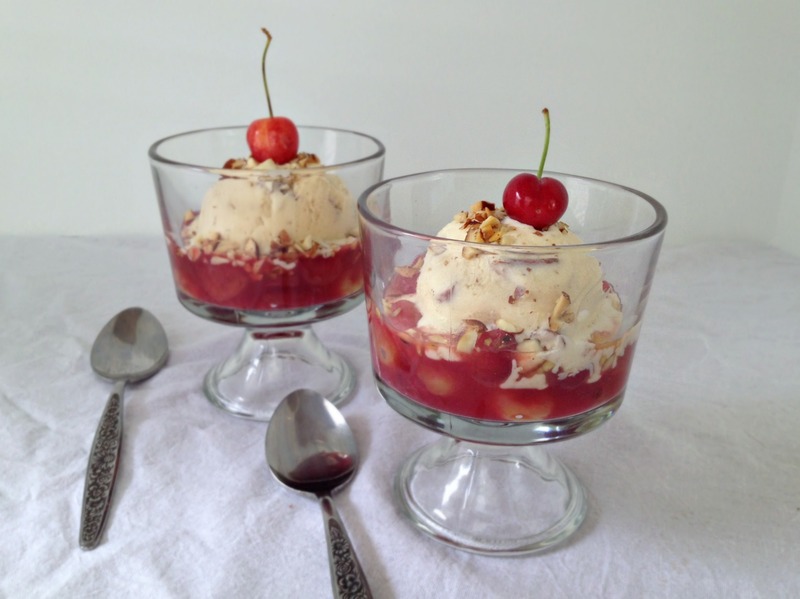 Pour warm cherries into dishes, top with scoops of ice cream, and sprinkle with finely chopped almonds. Serve. 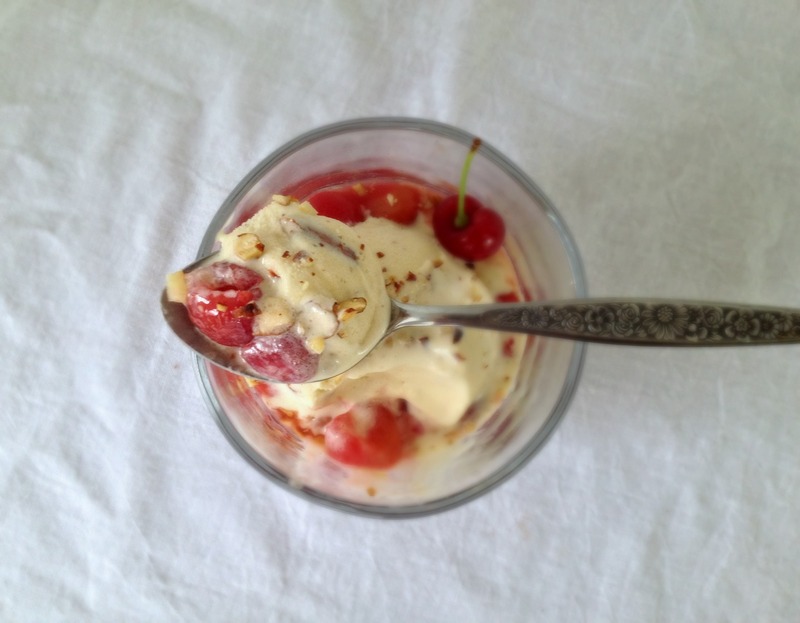 I’ve been waiting for a new post from you for what feels like forever :-) This is a gorgeous gorgeous recipe – I love the sound of the cherries but it’s the ice cream that has stolen my heart. Haha, I’m sorry! There was one last week but it was savory: Lamb Meatballs with Rhubarb Chutney :). I hate to say things like this because I’m sure it will later get dethroned, but this might be my favorite ice cream flavor I’ve made. I love this story. I used to take the 66 for years (from Harvard Square to Allston) and I don’t miss it at all :) Amaretto ice cream with cherries sounds perfect. I don’t blame you, Bianca! And I know you are one to appreciate a slightly boozy dessert ;). I don’t know what I like better about this—your writing or your cooking. Wonderful! Thank you for the kind words! The cherries make it easy. Jenny! Thanks so much for stopping by. That’s so nice of you. If I had you to take the photos, they’d be much better :).